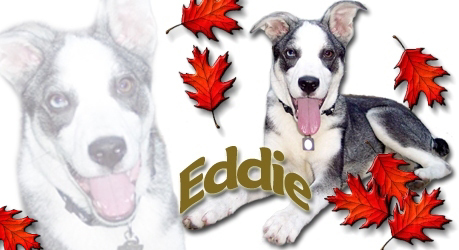 Eddie came to rescue as a four month old sick little puppy from a shelter. He fought with every ounce he had for his life for 6 long days in the hospital....and made a full recovery! 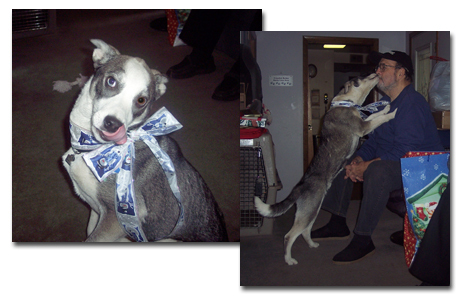 He was fostered for the next two months and during that time my dad fell in love with him....he coincidentally lives upstairs from us in a duplex:) So for Christmas, I finally gave up saying "no, we can't keep him" and put a bow on Eddie and gave dad the good news! So, Eddie has the best of both worlds now....he gets spoiled to death by my dad upstairs all day and when he gets bored, he comes down and plays until his hearts content with Kya and the gang at my house! He's hogging the bed, licking the left over ice cream in the bowl and kissing my dad all the time...welcome home little Ed!